Summon: Put an Experimental Scroll into your hand. 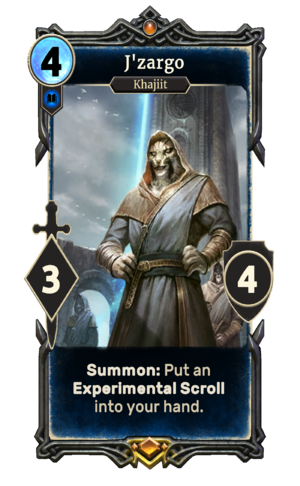 J'zargo is a unique legendary Intelligence creature card. It is part of the Heroes of Skyrim expansion. "Try to keep up with J'zargo." "J'zargo comes out on top!" J'zargo first appeared in Skyrim. This page was last modified on 27 February 2019, at 23:48.